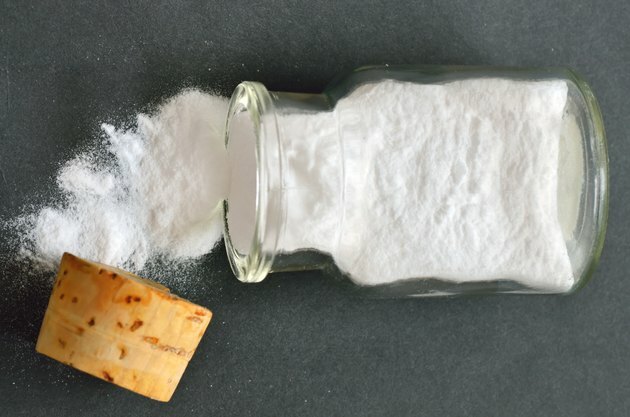 Calcium bicarbonate is not a naturally occurring solid, but it does form in water when calcium, carbonate and bicarbonate ions are dissolved with carbon dioxide. This commonly happens within rivers, streams, lakes and well water because of the water's exposure to the air and its contact with rocks and sediment that contain minerals and metals. Water with calcium bicarbonate is healthy to drink because of the mineral content and alkalizing affect, although it can cause build-up in your bathroom and kitchen and be difficult to clean. Water with high calcium bicarbonate content is often referred to as "hard water" because of the scale it leaves in pipes and sinks. It also reacts with soap to form "soap scum" in your shower and bathtub. Water filters, such as reverse osmosis systems, filter out minerals and dramatically reduce the calcium bicarbonate content in water. This may be convenient for a clean bathroom, but minerals are essential to your body and they have alkalizing properties. Calcium bicarbonate is sometimes confused with sodium bicarbonate, which is an antacid used for short-term relief of heartburn, indigestion and various stomach problems. Sodium bicarbonate injections are sometimes indicated in the treatment of metabolic acidosis, which is an acidifying of your tissues due to kidney disease, uncontrolled diabetes, circulatory problems, anoxia, severe dehydration, severe diarrhea, drug overdose and some other diseases and conditions, according to the book "Medical Biochemistry: Human Metabolism in Health and Disease" by Miriam D. Rosenthal. Calcium bicarbonate should also be differentiated from calcium carbonate, which is commonly used as a calcium supplement because of its high percentage of elemental calcium, as explained by Benjamin Caballero, author of the "Guide to Nutritional Supplements." Calcium carbonate is the primary ingredient in antacid tablets because of its alkalizing effect on excessive stomach acidity. Calcium carbonate is not as well absorbed as other supplemental types, such as calcium citrate. According to the American Institute of Conservation, calcium bicarbonate solutions have long been used in paper washing treatments, especially for works of art or historically important documents. Calcium bicarbonate solutions are useful because they not only neutralize acids in paper, but they also impart an alkaline reserve of calcium carbonate to the paper, which helps protect it from future damage. Calcium bicarbonate is also the primary source of minerals for the formation of stalactites, stalagmites and columns seen within caves. As water containing carbon dioxide passes through limestone, it dissolves some of the calcium carbonate over time and becomes richer in bicarbonate composition. When groundwater enters a cave, the excess carbon dioxide is released from the solution of bicarbonate, causing the less soluble calcium carbonate to be deposited. The deposits often make interesting "icicle-like" shapes.